I don't go to the Children's Theatre often, but when I do I always have a great time watching the show as well as watching the children in the audience watch the show. For a seasoned (one might say obsessive) theater-goer like me, it's a different dynamic when there are so many little ones in the audience. They're so present and vocal about their reactions, whether it's joy or surprise or laughter. Such is the case with Shrek: The Musical. This is a blockbuster-movie-turned-musical done well, with book and lyrics by playwright David Lindsay-Abaire (Rabbit Hole, Good People, Fuddy Meers) and music by composer Jeanine Tesori (who also wrote one of my favorite musicals Violet, now playing on Broadway). I liked it more than I expected to when I saw it on tour a few years ago. For this local production, the Children's Theatre Company has put together a dream team that includes the Theater Latte Da trio of director Peter Rothstein, music director Denise Prosek, and choreographer Michael Matthew Ferrell, as well as a top-notch cast of adults and children. Shrek is a funny and heart-warming story that turns the traditional fairy tale on its head - "true love" is not only for pretty and proper princesses and their handsome knights, but can be just as strong and beautiful between two crass and flatulent ogres. True beauty is simply being yourself. After being kicked out by his parents at age 7, as is the ogre way, Shrek is living a solo life on his swamp, telling himself he's happy away from the "Big, Bright, Beautiful World." The swamp is soon invaded by a bunch of fairy tale characters, from Pinocchio to the Big Bad Wolf, who were banished from the city of Duloc by the evil Lord Farquaad. Shrek heads to Duloc to try to remedy the situation, and picks up Donkey along the way, his new best friend and a constant source of annoyance. The vertically challenged Farquaad takes the opportunity to send Shrek on a task that he's unwilling to do himself - rescue Princess Fiona from her tower so that he can marry her and become King. Fiona has been waiting all her life for a knight to rescue her, just like in the fairy tales. She's somewhat disappointed when her rescuer is an ogre, but is reassured when they tell her they're taking her to a Lord in a castle. Along the way something unexpected happens - Shrek and Fiona realize they have a lot in common, from their unhappy childhoods (leading to the charming song "I Think I Got You Beat") to their talent in making bodily noises. 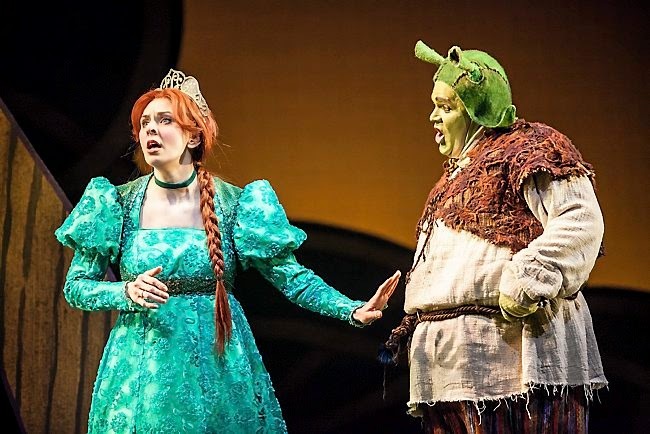 But secrets, miscommunication, and expectations lead Fiona to go through with the wedding, until Shrek comes to stop it by telling her the truth about his feelings for her and the man she's about to marry. And these two crazy ogres and their wonderfully freakish friends live happily ever after. This fantastic cast is led by Reed Sigmund as Shrek and Autumn Ness as Fiona, both so funny and full of life, with great chemistry (not surprising since they're married in real life). Ansa Akyea is gleefully charming as Donkey, and Adam Qualls is deliciously evil as Lord Farquaad. One of my favorite characters in this piece is the dragon, who becomes a sympathetic character through the powerful voice of Lauren Davis as she laments that no one has ever come to rescue her, raised high on some magnificent contraption with huge flowing wings. Which brings me to the other star of this show - the costumes by Rich Hamson (who is also responsible for the delightful under-the-sea world at the Chanhassen). The costumes are ridiculous in a good way - bright and colorful and fantastical, and there are a lot of them. I could not get over the fast and frequent costume changes by the ensemble members; for example, Rachel Weber goes from a villager to a Little Pig to a tap-dancing Duloc guard to part of the dragon to a blind mouse to ogre Fiona and back again. These many crazy costumes and the warm green world with set pieces and flowers rising from holes in the floor are a feast for the eyes (set design by Kate Sutton-Johnson). 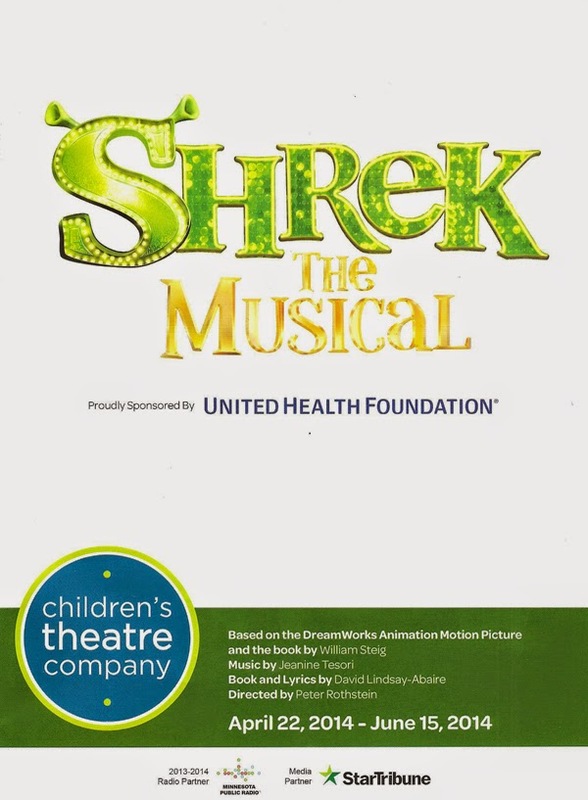 Shrek: The Musical is great good fun for cast and audience, adults and children. Check it out before it closes on June 15.